Donald J. Kavanagh, principal of La Salle Academy in Providence, Rhode Island, was presented with Letters of Affiliation (AFSC) during a ceremony held October 13, 2018. 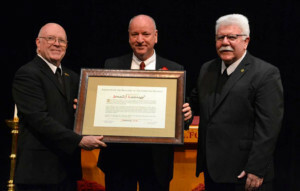 Brothers Thomas Casey and Richard Galvin, Auxiliary Visitors of the District of Eastern North America (DENA) presented Kavanagh with his Letters of Affiliation. Kavanagh has served in Lasallian schools for 37 years, as a teacher, coach and administrator. From 1973-1984, he served as a teacher and coach at La Salle Academy; from 1984-1993, Kavanagh served as athletic director and assistant principal for Student Life at Saint Raphael Academy in Pawtucket, Rhode Island; in 1999, he acted as a senior dean and assistant principal for Student Life at La Salle Academy; and, since 2000, Kavanagh has served as principal of La Salle Academy. Approved by the Superior General, Letters of Affiliation are the highest honor the Institute of the Brothers of the Christian Schools can bestow on lay people, making them an honorary member of the Institute.